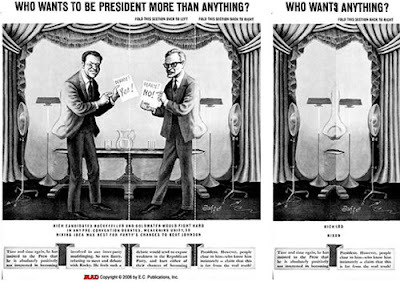 b) Mad magazine fold-in idea? The search for more Bes artifacts though did not really help me to get into the core of the image, however the inner Giger told me "Erm, step back from it". 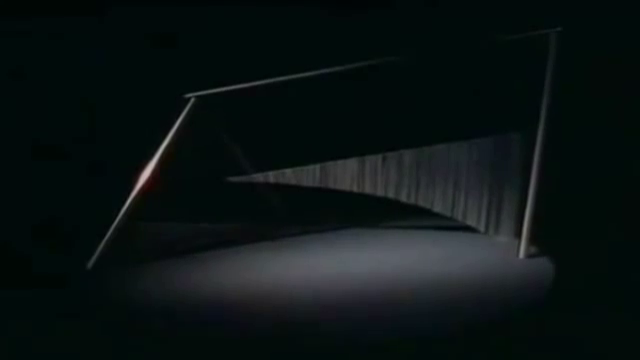 Then mentally pulled back from the image and waited for something else to happen in terms of having a new idea. 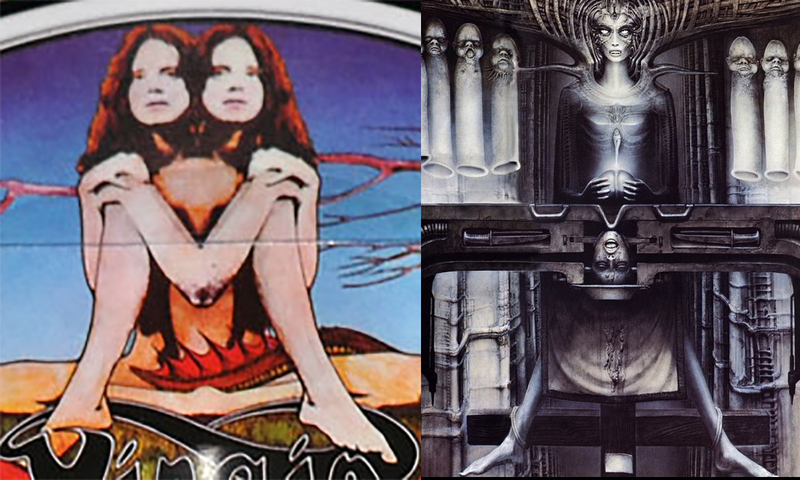 I started to think about the two females separated by the expanse of the table and I wondered perhaps if they came together they would form something just as with the fold in page from Mad magazine. Here in the example below, two sides of Nixon's face are separated by a table. 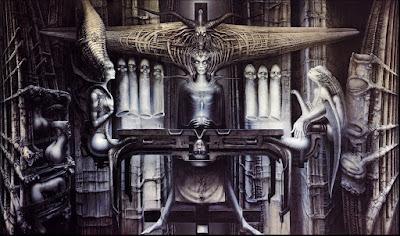 The space beneath the arm of the figure of the right caught my attention, perhaps it was shaped like Giger's eyebrow, with the arm widening near enough conforming to the ridge above the eyebrow itself on the side of the forehead and so the metal structure showing itself within becomes the eye. 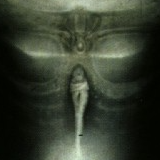 Where the buttocks of the woman is, would be where her nose is. I wondered for a little while if the ridge on the shoulder might be the hairline with the hair brushed aside. 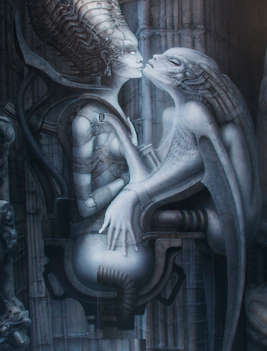 If it is to represent his face, I admit it is a little hard to really state it is something specific, because it's very unspecific and it's most likely that if he wanted to show his face in it secretly, he gave up any hope of showing a recognisable likeness just to make the human figures look nicely painted.. So where else was this going. 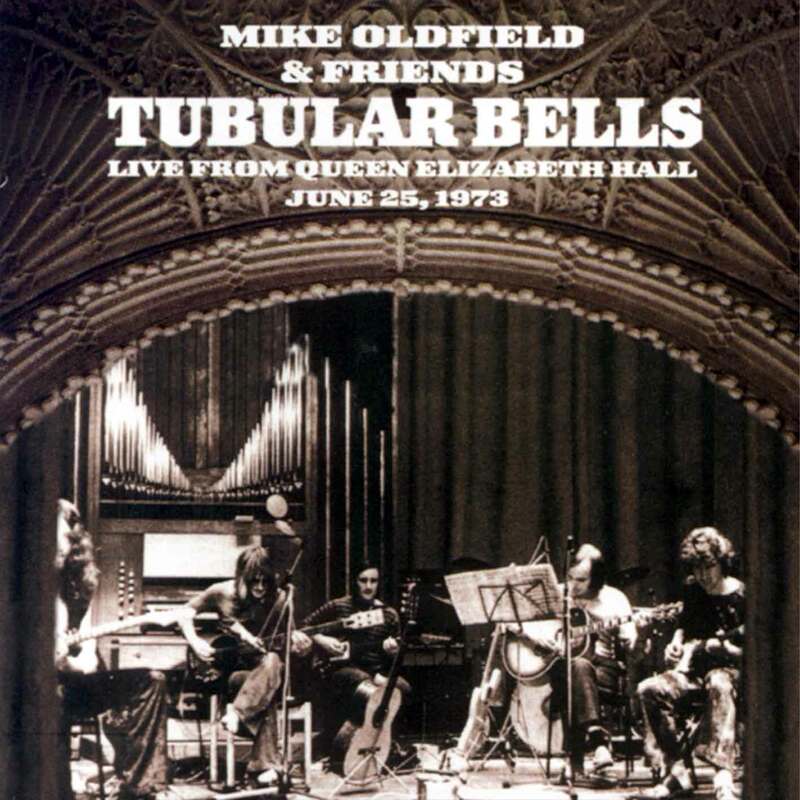 I still didn't have much of a clue about what the point of this wide head dress was and then I suddenly took a look at the row of phallic fetuses whose symbolism I couldn't decipher, I wondered if they were organ pipes, but there was no sign of an organ being played and then thought, "hmm, they're hanging there like a row of tubular bells as in, ha ha, Mike Oldfield's Tubular Bells". 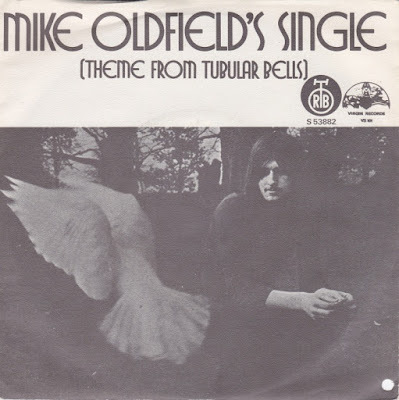 This album was rather famous in its time and the title would have been on the tips of people's tongues. 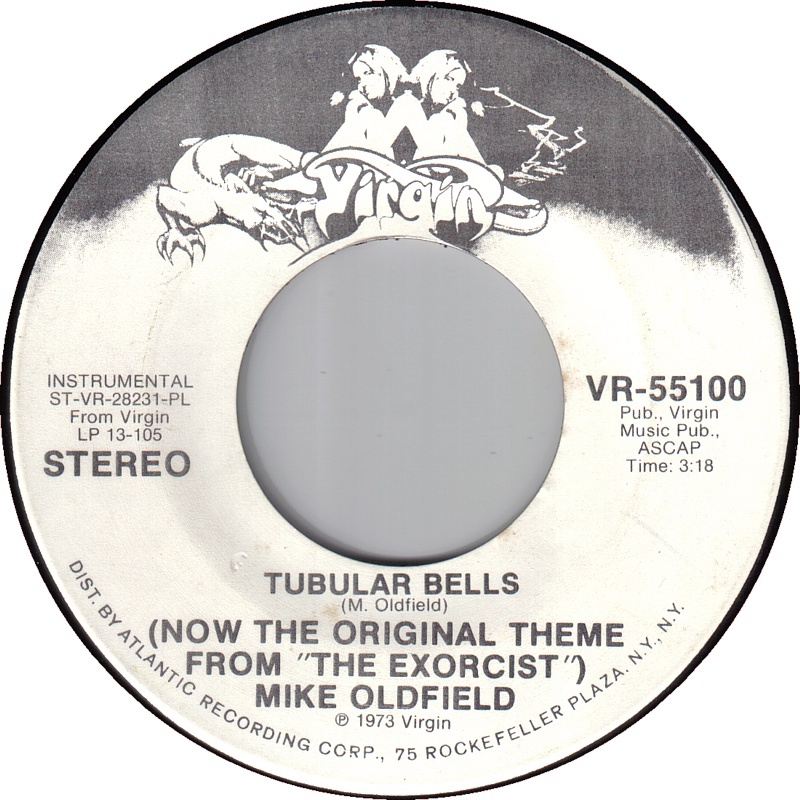 What's more the album was released in 1973, and the music featured as the theme for the movie The Exorcist in 1973. 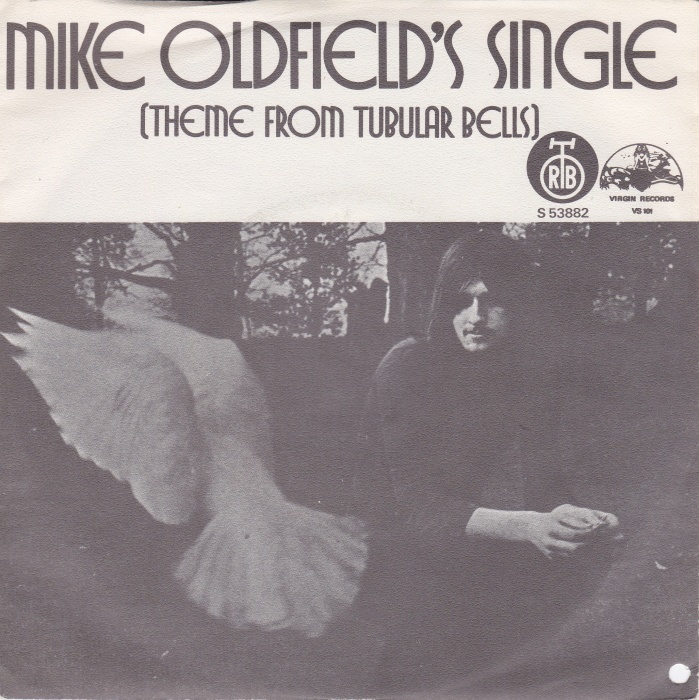 Thinking about the Tubular Bells title is all very well making this association but was there something else to tie it further in. 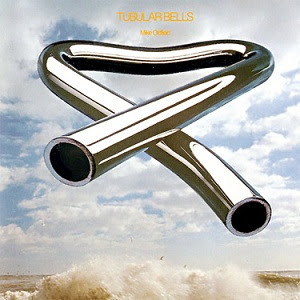 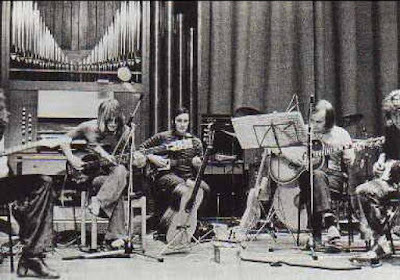 I had been looking for images of the time when it was released to see if there were images of real tubular bells. The photos of the peformance at the Queen Elizabeth Hall showed large metal tubes along with smaller ones from an organ and here curtains that suggested themselves enough in the painting. 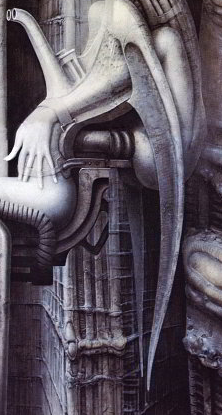 The large tubes, Giger turned into his tubular bells. 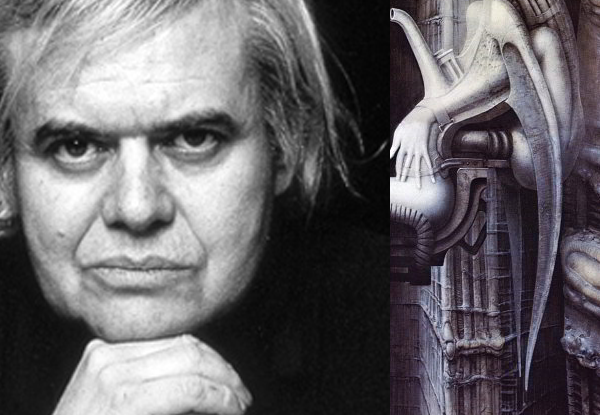 Another aspect I would come to terms with on January 8th 2016 was the possibility that Giger might also have been inspired by a row long narrow cathedral windows that he decided to turn into tubular fleshy structures. 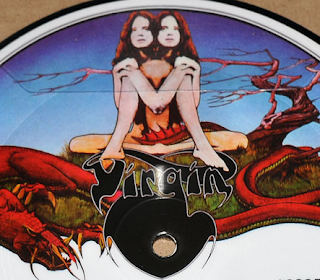 I took a look at the label for the record and then noticed it was on the early Virgin Record labels and then I started to suspiciously notice how odd the label seemed with the image of half a woman reflected so that she had two heads, a conjoined shoulder and elbows, sitting with a tree to the right and a dragon around the bottom. The G in Virgin expanded into a strange black shape around the record hole with many possibilities. 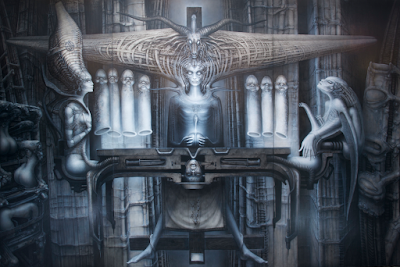 I looked further at the female figure and then noticed similarities between it and the central figure Giger's The Spell II, along with other details. 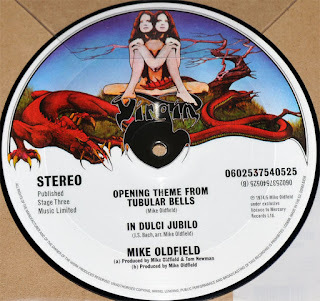 Note the position of the legs, the V shaped fused arms on the Virgin Label and the V shape in the table, the branches going through the shoulders on the label and the shoulder tendrils in Spell II. 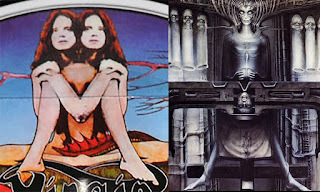 The dark space between the two heads on the label becomes where the woman in The Spell II's head manifest. 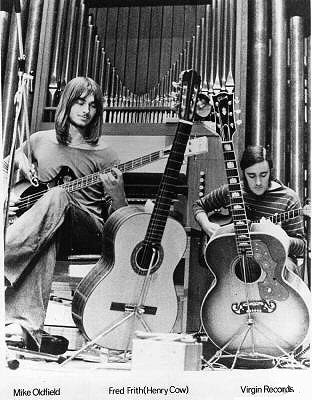 The shoulder in the label becomes reflected to widen and become the strange domed top of the phallic shape being handled on the table. The black shape connected to the letter G on the label also becomes transformed into features of the table such as the legs, and also becomes the starting point the head dress of the central women and then it became more and more elaborate. 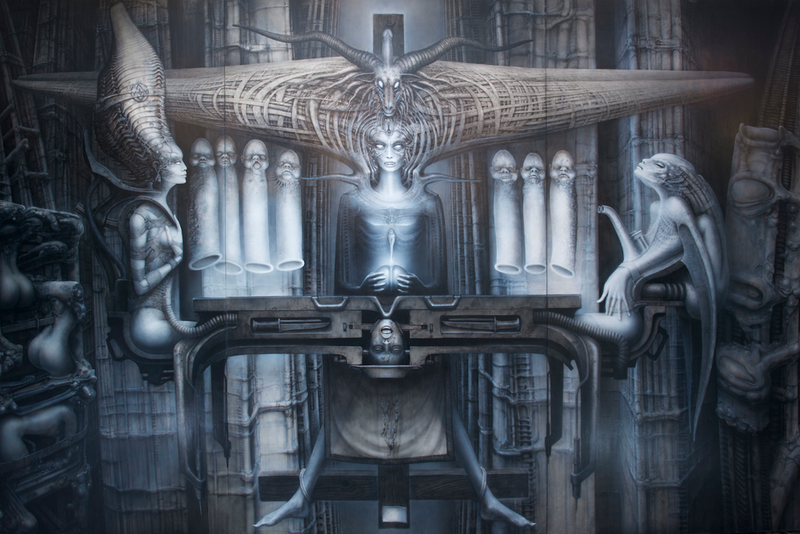 At the exploration ended, the Giger of the mind revealed "That's about it"
The whole of the woman's body becomes informed by the picture from The Demon. 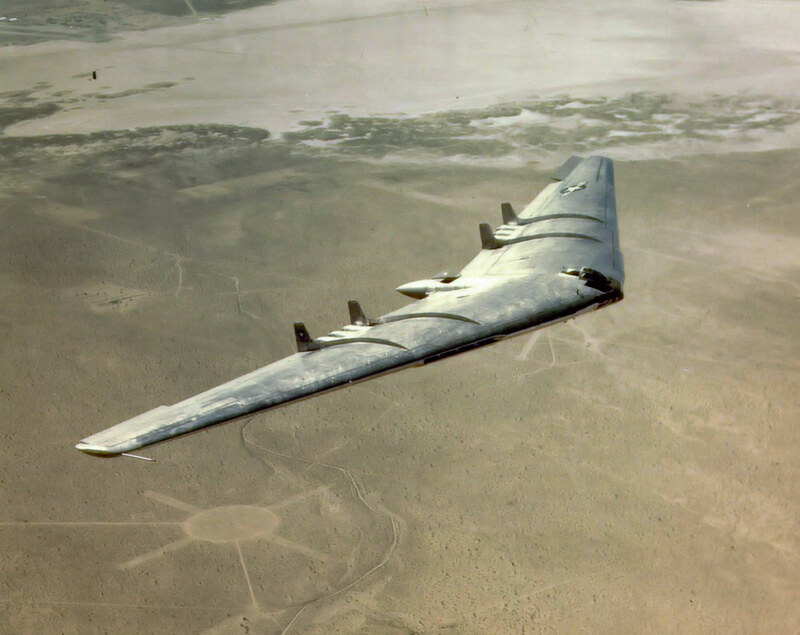 The elaborate arms of the sculpture in the comic book story becomes transformed into a wide headdress resembling a wicker version of a flying wing. 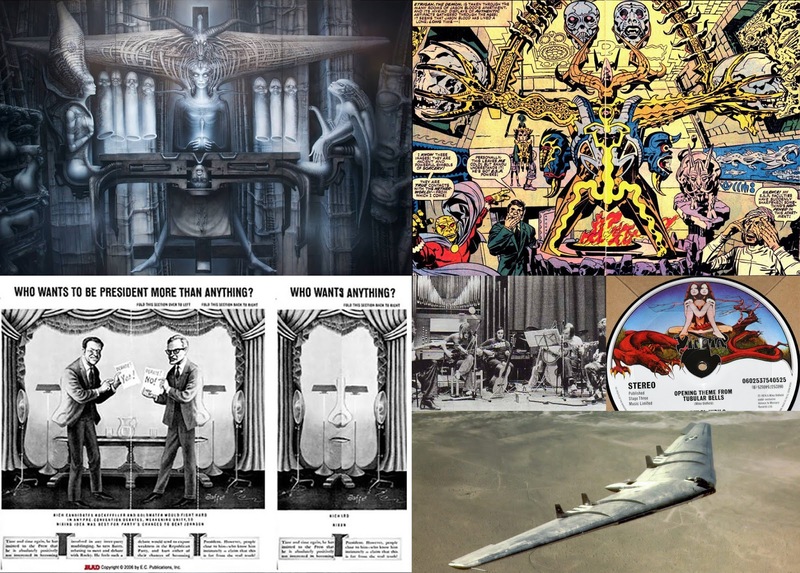 The yellow framework with a round head like shape with a hole in it and below are yellow framework shapes like like wings that become the shoulders and beneath that the yellow wavy column supporting this lead down to the diagonal supports at the bottom become transformed into the legs in Giger's painting, merged with the reflected legs from the Virgin record label. 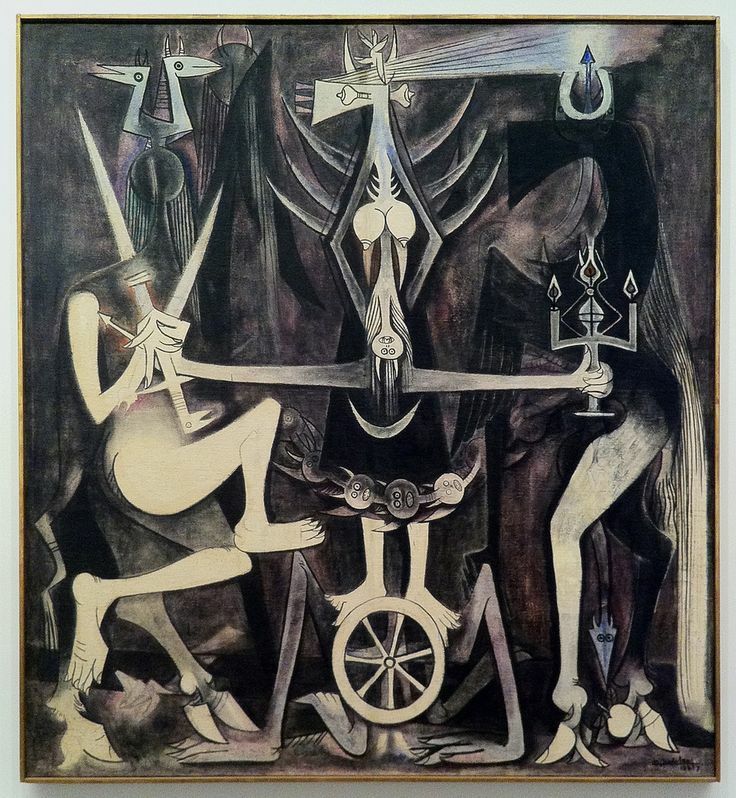 The small inverted Elegua horned horned head in the centre becomes the sacrificial victim in Giger's painting and the chain of elegua heads at the base of the skirt of the central humanoid becomes the left arm of the idol in Kirby's illustration.